This workshop is an ideal on-site training adaptable to a variety of group sizes. It will introduce organizations to the idea of organizational culture, the types and characteristics, and the many implications for business operations. For pricing, select "Workshop" on the contact form. 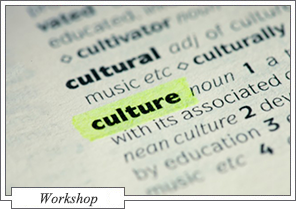 Participants will complete the Organizational Culture Assessment Instrument (OCAI) survey approximately one month prior to the training. The Eppley Institute will then calculate the OCAI results and prepare feedback for the participants. This training is designed to introduce organizations to different organizational cultures and how they affect day-to-day operations, employee morale, and the organization’s future. Based on the results of the OCAI, participants will discuss the implications and the pros and cons of the current and preferred state of their organizational culture. The facilitated discussion will result in the identification of specific steps to move from the current to preferred culture for the organization in light of the OCAI results. Please contact us for more information about setting up this workshop for your organization. Select "Workshop" on the contact form, here.